Scooters normally operate at city-level. They must be comfortable riding up and down small, narrow places with tight turns. You should be able to U-turn in a phone booth. You need to accelerate to street speed quickly. You need to have visibility because you’re small and there are some really big dinosaurs out there that will step on you and not realize it or care. 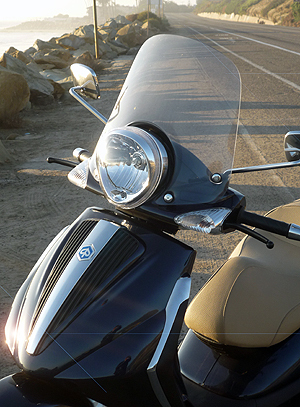 Continue reading Piaggio BV250 Tourer – Day 6 – Scootering has made me a better rider. Posted on November 12, 2008 Categories bike reviews, scooter reviews, scootersTags buying a scooter, BV250, BV250 Tourer, Italian Scooters, Maxi Scooter, motorcycle technique, Piaggio, Piaggio Reviews, Piaggio Scooter, Scooter review, scooter training, Vespa alternative12 Comments on Piaggio BV250 Tourer – Day 6 – Scootering has made me a better rider. It really is a pretty ride. Very light, with lots of plastic panels over a steel frame, yet rattle free and solid. Nice color-contrasting seat, and a big headlight gives it kind of a “Lambretta-like”, tall stance, but with everything new and updated. This is NOT your Roman-holiday Vespa. This is a 250cc maxi scooter with 50 years’ development behind it. Continue reading "It's the Coolest Scooter I've Ever Seen." Posted on October 29, 2008 Categories bike reviews, scooter reviews, scootersTags buying a scooter, BV250, BV250 Tourer, Italian Scooters, Maxi Scooter, Piaggio, Piaggio Reviews, Piaggio Scooter, Scooter review, Vespa alternative3 Comments on "It's the Coolest Scooter I've Ever Seen."